With more and more unfortunate circumstances occurring all around us, property safety falls high on most people's priority list when deciding where to live. 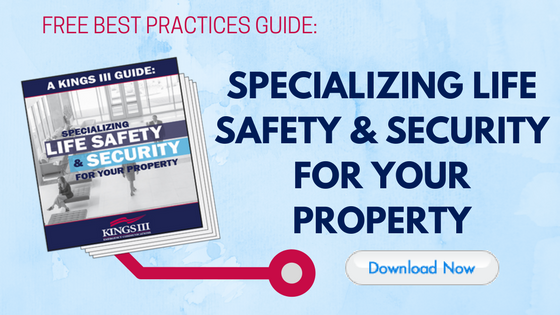 Here are some property safety amenities that will help you stand out to potential residents. Now that an increasing number of Americans -- especially millennials and up-and-comers -- are choosing renting over buying their homes, the amenity game has become intensely competitive, as they are no longer optional benefits, but key differentiators that set you apart. Amenities can range from dog parks to green spaces to yoga classes, but savvy property managers realize that some of the most appealing amenities for most residents are those that address security and life safety. Although property safety itself isn’t considered an amenity, it should be. Certain life safety and security features go above and beyond what is required to create a safer environment and can be offered as a strong deciding factor to potential tenants on the fence who are looking for peace of mind. Access cards, fobs or mobile phone IDs are the new keys. The traditional mechanical lock and key is perceived as old-school these days. Younger residents especially now expect keyless entry, which can be changed with each new tenant and can limit or grant access to visitors. Many systems include cameras that can keep a visitor log, including timestamps. Residents can control the lock from a smartphone app (using a PIN number) and can receive real-time notifications of door usage. These newfangled locks can often be retrofitted onto an existing lock. e-Commerce Lockers protect packages from theft. The NMHC reports that nearly half of Millennials receive online packages at least three times a month on average; more than half desire package lockers in their apartment buildings. As opposed to a typical door delivery, e-Commerce lockers can keep packages safe and secure until the tenant arrives home; lockers can be accessed 24/7 with a PIN code. Some property managers are even offering refrigeration lockers as an amenity, to address the increasing preference of online grocery shopping and food delivery. Video doorbells control visitor access. In many cases, securing the property means securing access to the property. It’s often difficult to control who enters a building, but once an unwelcome visitor is inside, anything can happen, from theft to vandalism, or worse. Video doorbells allow residents to speak to visitors without having to open the door, track visitors who were there while he or she was away, and add another layer of security with one more video camera to patrol the premises. Motion sensor lights increase visibility. As residents leave or arrive, motion sensor systems immediately light their way and can reduce anxiety and possibly even crime or accidents. It also reduces your energy bill, as the lights are used only when truly needed. These systems are great for commonly used areas, such as hallways, stairwells, parking lots and entryways. As they increasingly become an expected amenity, they are now easier to install and maintain. Most motion sensor lights offer the option of operating the traditional (manual) way, if needed. Having a human being keeping watch over access to the property can be a huge plus in attracting residents. Security officers act as a crime deterrent, but keep in mind when hiring security for the premises that you are not hiring actual police officers. Not all security personnel receive the same kind of training when it comes to responding to crime in real time. Also, they can often be expensive (usually billed in hourly rates, often running higher during evening hours), making it impractical for smaller property management budgets. Wireless cameras can cover more ground than a security guard. The mere presence of video cameras can serve as a crime deterrent and add an extra layer of protection to your security plan. However, it may get expensive to install numerous cameras throughout the property - the more cameras you have, the more staff you’ll need to monitor them. Emergency phones help residents in areas where crime and/or accidents may occur. In addition to your elevator, where emergency phones are required, these locations include garages, stairways, hallways, parking lots, pools, common areas, fitness centers and garbage collection spaces. Call boxes in these areas can save lives and prevent crime. An emergency response call box or phone will help contact authorities faster than a phone app or smart phone, as a call box is programmed to contact help directly and immediately at the touch of a button, automatically providing a fixed, known location and without the risk of a dropped cell signal. Furthermore, when using a monitoring service like Kings III, your residents will be put in touch with professionals who can dispatch help and provide medical instructions until it arrives, helping to alleviate panic and discomfort. Click here to find out why old-school emergency phones are more effective than phone apps. Kings III's all-inclusive services provide you with the option of a complete package of code compliant emergency telephone equipment, installation and maintenance, plus 24-hour state-of-the-art monitoring and dispatch services. Emergency monitoring is one button away for residents to seek help. Whether a resident is stuck in an elevator or witnessing or experiencing crime, an accident or a health crisis, they can immediately contact a team of 24/7/365 operators certified as Advanced Emergency Medical Dispatchers (AEMD). This staff should also be certified in Red Cross CPR and HIPAA in order to assure the best and fastest response. Kings III operators have all of the above certifications and provide aid to callers in more than 175 languages -- a higher level of certification than is often required in 911 emergency response centers. By utilizing the above amenities, your property will seem more appealing, state-of-the art modern, family friendly and most importantly, perceived as safer overall. To learn more about how Kings III can further help you protect your residents and increase the life safety and perceived value of your facility, visit www.kingsiii.com. Click here to discover the five key elements of property safety, including crime prevention, maintenance, and emergency preparedness.